The origins of written communication extend nearly 5,500 years into the past and trace back to the modern day country of Iraq. Whether one examines the wedge-shaped markings of Sumerian Cuneiform, the organic flourishes of Brahmic letters, or the ornate embellishments of Insular script, there is a spellbinding intricacy and attention to detail found in the writing styles of ancient cultures. By the start of the 20th century, the art of writing by hand was no less remarkable. In fact, an entire industry of highly talented craftsmen was employed in the field of commercial hand lettering for business and advertising. 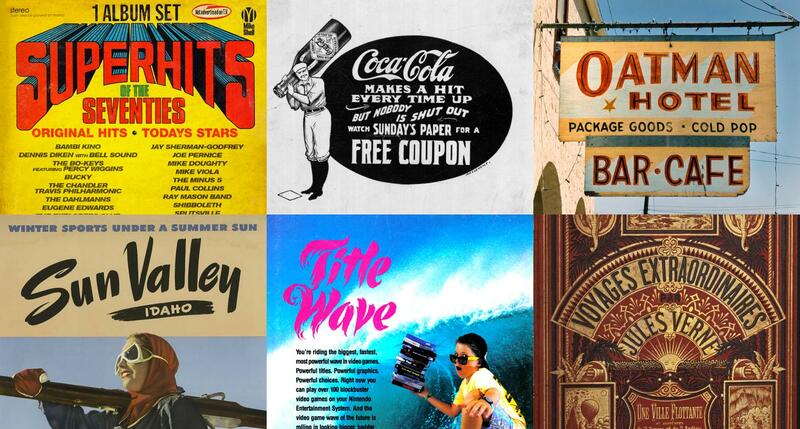 From art deco product packaging of the 1920s to mid-century modern motel signs of the 1950s and pop-art film posters of the 1970s, we see a spectacular smorgasboard of lettering styles and techniques—all done by hand. By the early years of the 21st century, hand lettering continued to be practiced by a niche group of specialists, but thanks to the advent of desktop publishing, the look and feel of typography at large was distinctly digital. Fast forward to the spring of 2012 and the meteoric rise of Instagram. Roughly a year and a half after its launch, the image sharing app was being downloaded over 100,000 times per day in the United States. Savvy artists, designers, and photographers began capitalizing on the platform’s popularity and gaining massive followings. Hand-lettering artists also contributed to the content boom with daily posts highlighting work-in-progress, commercial projects, and inspiring brush pen quotes. As more letterers uploaded work, competition for views and followers increased, and the quality of lettering was propelled to a new level. Today, hand lettering is once again a formidable force in the world of visual design and advertising. Before we venture into specific tools, techniques, and processes, we should pause and survey the scene of contemporary hand lettering. Truly, there is no lack of inspirational talent, especially among the pack leaders, the hand-lettering artists working side by side with global brands on highly visible advertising campaigns. Gemma O’Brien is a prolific Australian lettering artist with a style that is equal parts bold, organic, and ethereal. She uses a variety of tools and techniques but is perhaps most well-known for her ambitious, typographic murals. 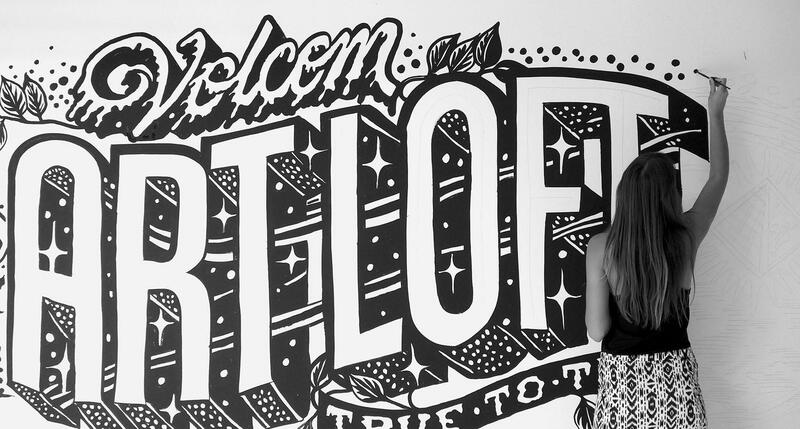 O’Brien’s black and white Artloft mural for Volcom’s Costa Mesa headquarters is a gorgeous example of her ability to balance high-impact letterforms with a free flowing sense of compositional weightlessness. 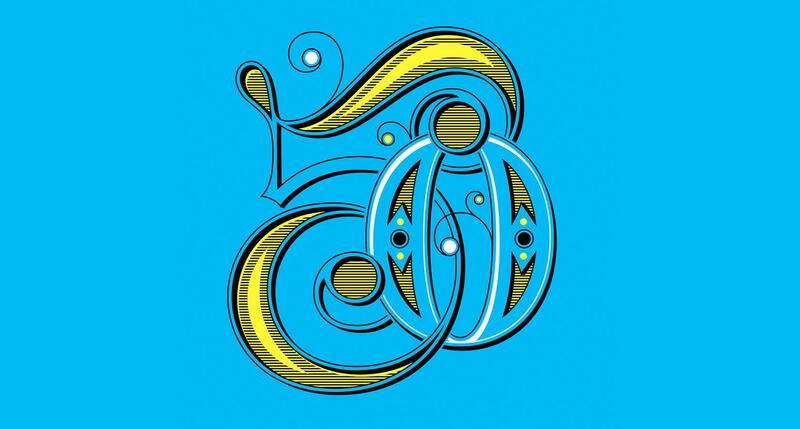 Dublin, Ireland-based designer Steve Simpson is famous for his wild and whimsical approach to lettering. His work is often jam-packed with bright colors and fantastic characters, yet a keen sense of typographical hierarchy ensures that his hand lettering is never lost within a composition. 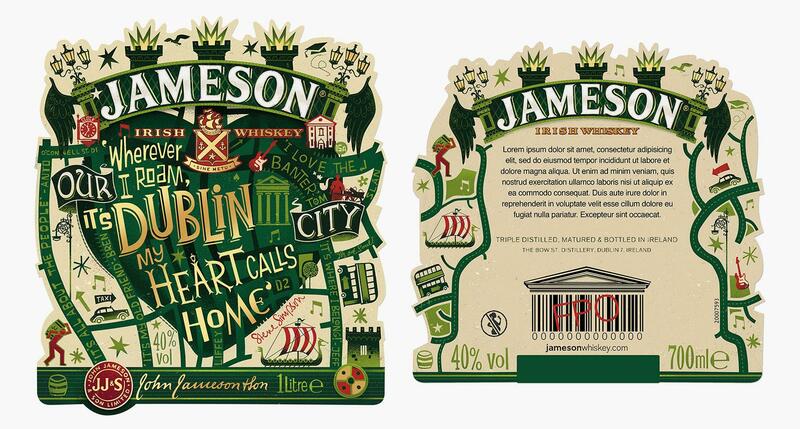 Take, for instance, this label for a limited-edition bottle of Jameson Irish Whiskey. Simpson uses every square inch to tell a story. Details abound, but the Dublin devoted message rings through loud and clear. The lettering and illustration work of Seattle-based artist Dana Tanamachi exemplifies elegance and sophistication at its finest. Her hand lettering style is tightly structured and ornamental, yet warm and approachable. It’s no wonder, then, that Crossway Books felt comfortable commissioning Tanamachi to lead one of the most ambitious hand lettering projects on record—the ESV Illuminated Bible. 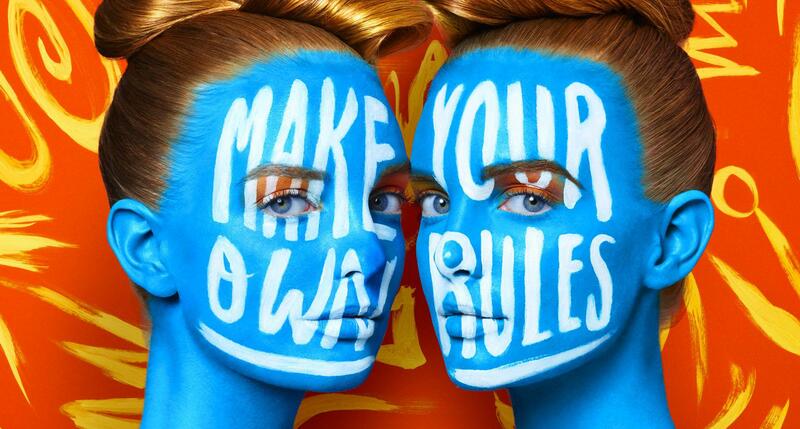 Paul Von Excite is a Dutch designer specializing in lettering for brands. His custom logotypes are comprised of meticulously crafted letterforms, but at the same time, his work exudes a sense of buoyancy that is rare among corporate identities. 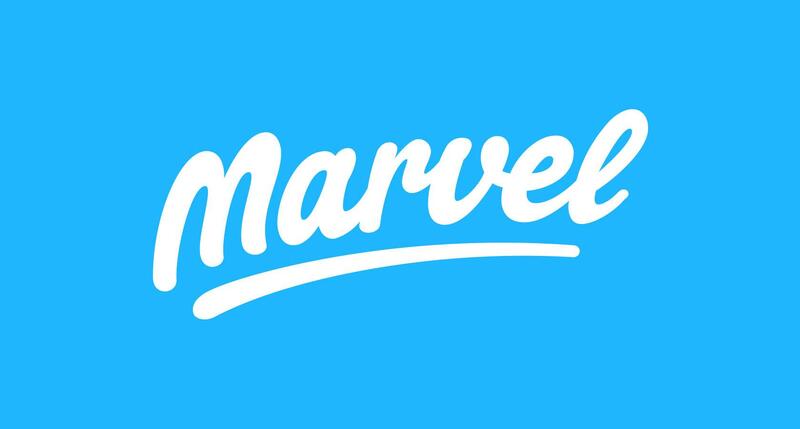 The custom logotype Von Excite designed for the prototyping platform Marvel exemplifies all these traits, and his project case study provides practical insights into the hand-lettering design process. If you’ve ever wondered how much creative ability could be packed into a single human hand, simply view the design of David A. Smith, a UK based sign-writer focused on sharing lettering techniques of a bygone era with a contemporary audience. 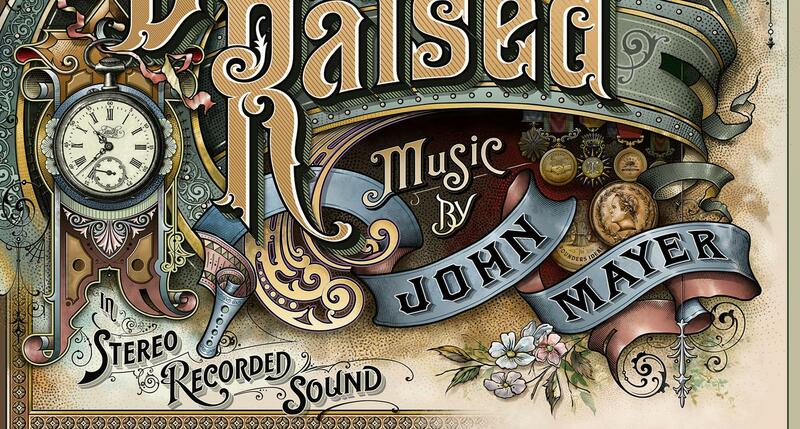 The full breadth of Smith’s skills are on display in the cover art he designed for John Mayer’s album Born and Raised. Each word is an opportunity for invention, each letter an exploration of form. A wide range of commercially viable styles is represented in the work of these five leading hand-lettering artists. That’s the advantage of hand-drawn letterforms. Depending on the audience and intent of the message, each letter can be carefully crafted to convey the appropriate meaning. When it comes to hand-lettering tools and techniques, the options are plentiful. There are countless varieties of pens, pencils, markers, inks, paints, papers, and substrates to choose from. Add in digital tools such as the Apple Pencil or Wacom Cintiq, and the possibilities broaden. Calligraphy is a form of decorative penmanship. Calligraphers use brushes and broad-tipped writing tools to create unique letterforms, often with only a few angled strokes of the pen. Calligraphy differs from fancy handwriting in that it places an emphasis on compositional harmony and often includes illustrative embellishments. 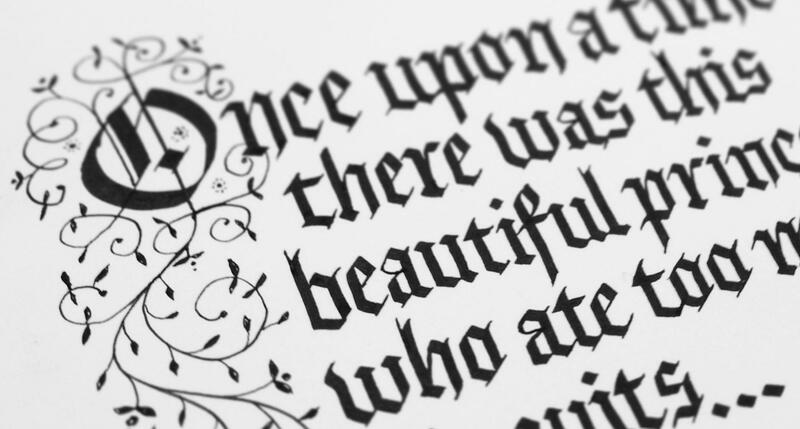 In recent years, calligraphy has experienced a resurgence in popularity, especially among professional hand-lettering artists seeking to merge old-school techniques with contemporary technology. Looking for a fast way to begin lettering? A ballpoint pen and lined notebook are all you need. For all its complexity, hand lettering doesn’t require much in the way of tools or training. A few bucks and a willingness to practice are the main barriers to entry. If you worry that such a simple approach is unprofessional, rest assured that many hand-lettering artists intentionally work in a style that accentuates the imperfection of their efforts. This is counterintuitive to pursuers of pixel perfection, but the human eye finds flaws pleasing. 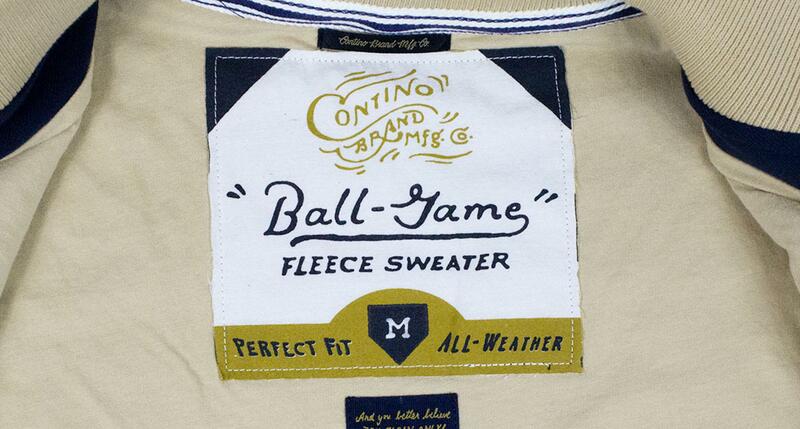 While there’s an undeniable charm to crooked letters, achieving such a look isn’t easy. If anything, hand lettering artists who utilize this style need a heightened sense of hierarchy, color, and compositional balance. Sometimes, designers skip the hand skills and head straight to the computer. This can be limiting, especially for new lettering artists who don’t fully understand how letterforms are constructed, so it’s tempting to ignore vector art as a viable method of hand lettering. However, there are a handful of highly successful letterers that would rather point, click, and pull bezier curves than push a pencil. For those that work this way, advanced knowledge of Adobe Illustrator’s Pen tool is crucial. Once vector letterforms have been built, however, the power of working digitally becomes clear. Curve precision, color, and sophisticated details require only a fraction of the time when compared to analog methods. 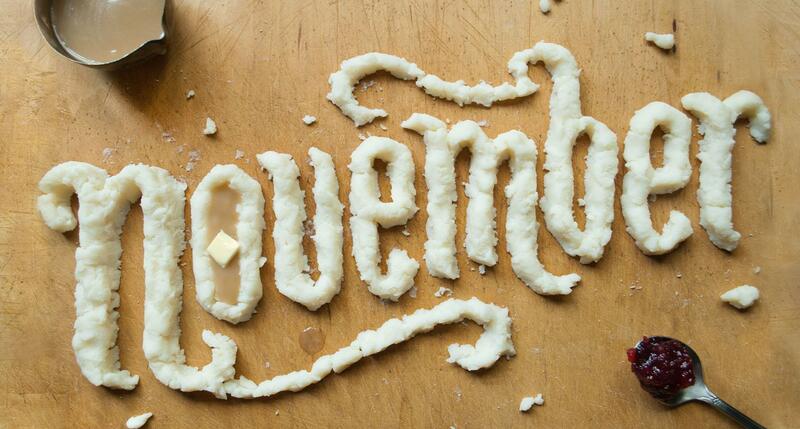 Lettering should be fun, and what could be more fun than turning food into words and getting paid for it? A growing number of hand-lettering artists have ditched the computer and started shaping, sculpting, and fabricating letterforms from various found objects. Besides the visual appeal, this approach is a great way to unify conceptual design elements. The selection and placement of objects, along with the setting of the composition and angle of photography, work together to create layers of meaning. It can be easy to fall in step with design fads. Almost instinctively, we inspect and mimic what every other designer seems to be doing, and we forget to try new things. Growth as a hand-lettering artist requires a willingness to risk and press into new ways of thinking and doing. So, don’t be afraid to experiment. There will be flops and failures—correction, there will be many flops and failures, but along the way, there will also be monumental breakthroughs that increase both confidence and competence. There’s no way around it. Truly exceptional hand lettering requires years dedicated to practice and experimentation. It should be self-evident given the name of the discipline, but one of the best ways to improve as a hand letterer is actually working by hand. It’s true that some very talented designers are able to begin lettering directly in a digital environment, but most aspiring hand letterers will need to hone their skills via pen and page. Additionally, there are some styles and effects that are impractical or nearly impossible to achieve digitally. The possibilities presented by creative risk and fortuitous accidents are the path to forging a distinct style, so don’t be afraid to work outside of the computer or search for inventive ways of merging digital and analog. On the surface, hand lettering is simple. Grab a pencil and a piece of paper and get to work. For the novice, there’s no better way to start, but for designers looking to add hand lettering to their list of services, a methodical approach will increase confidence and lead to more consistent results. 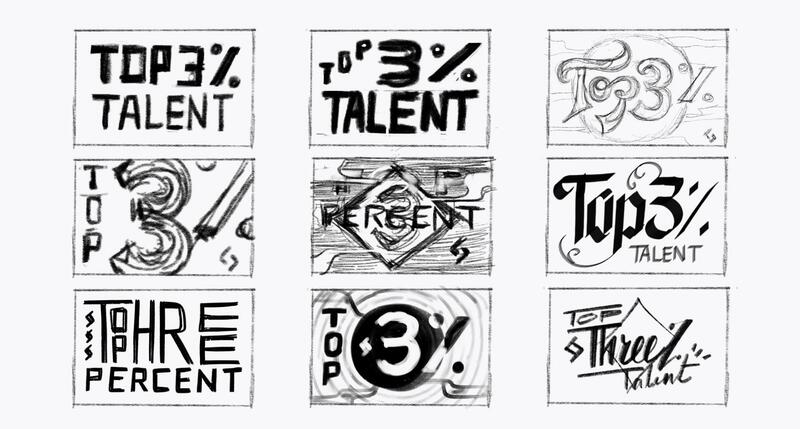 To demonstrate, I’ll create an original work of hand lettering for Toptal’s “Top 3%” slogan using a simple, six step process. Hand-lettering research may start in a variety of places, but early on, try to avoid popular design platforms like Dribbble, Behance, Pinterest, or Instagram. These sites are packed with world class lettering examples and the latest trends, but starting research here often leads to direct stylistic imitation. Drawing inspiration from industry leaders is great, but attempting to do what they do (worse than they do it) rings of amateurism. Luckily, letterforms exist everywhere. Look around. Signage, packaging, clothing, menus, websites, apps, magazines, old books, and even junk mail are lettering treasure troves. Instead of investigating online, start research with a walk through a grocery store, library, or busy part of town. Every time an interesting letterform appears, take a picture—even if it’s not exactly what you’re looking for. Regardless of where you choose to begin research, make sure you actually do it. Thorough research supercharges creative thinking and helps prevent subconsciously rehashing tired design solutions. 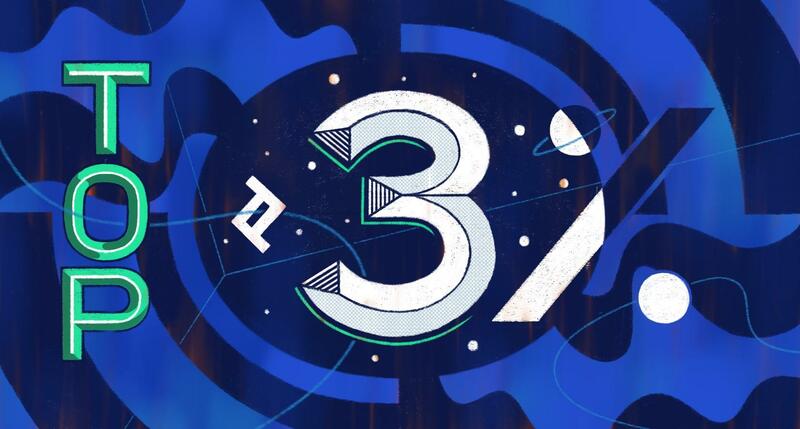 *Pro Tip: Keep an eye out for letters, logos, and typography that is exceptionally funky. If most designers would mock it, document it. Why? These kinds of examples, while not commercially advantageous, are brimming with interesting design quirks that can be recycled and refined in future projects. After research, or sometimes running alongside it, comes ideation, a phase in which the hand-lettering artist begins capturing ideas, often as thumbnail sketches. These sketches are the first attempt to lay hold of the nebulous forms and images that appear in the mind’s eye. They should be lightning quick and quite rough. There’s no exact number of thumbnail sketches that need to be completed. One project may require 20-40 while another only takes 2-4. However many it takes, don’t overwhelm clients by showing them every single sketch created during ideation. It’s your job as a professional hand letterer to curate the best concepts. *Pro Tip: Remember to ask these two important questions before starting any hand-lettering project: (1) What are the dimensions of the final piece? 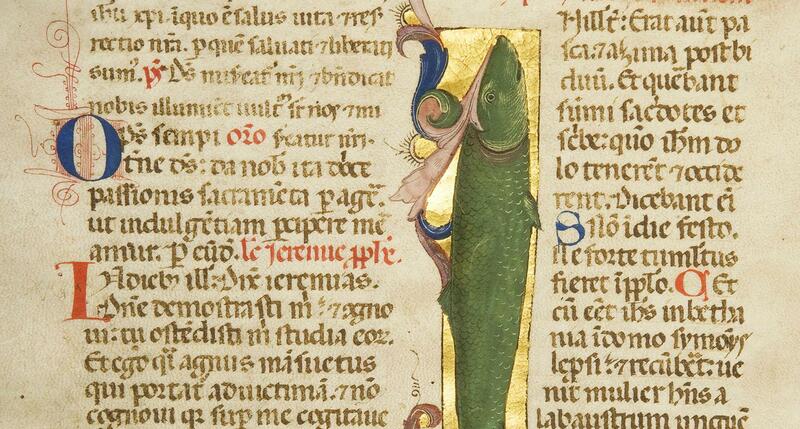 (2) Are there any photos, text blocks, or illustrations in the composition? Once a concept has been agreed upon, it’s time to pencil in the design. This step isn’t preoccupied with precision; it’s about forming the composition as a whole. Keep a loose grip on the pencil, draw quickly, and take several passes over the page as you calmly flesh out the letterforms. During this phase of the design process, don’t fixate on crafting perfect letters. And, don’t be afraid to use an eraser. Draw. Erase. Repeat. It can’t be overemphasized. Use a pencil. Use an eraser. Work loosely and quickly! Too often, inexperienced hand letterers make one tedious pass with a pencil before breaking out the liner pens. This is a mistake. A strong, well-structured composition always comes before precisely-drawn letterforms. *Pro Tip: Draw guides to help with letter alignment and spacing. No need to use a ruler or French curve for this part of the process. Your eyes, hand, and internal sense of scale and proportion will guide the way. With the composition penciled in, it’s time to add a layer of polish. Refinement unfolds at a slower, more deliberate pace, but the approach is similar to earlier steps. 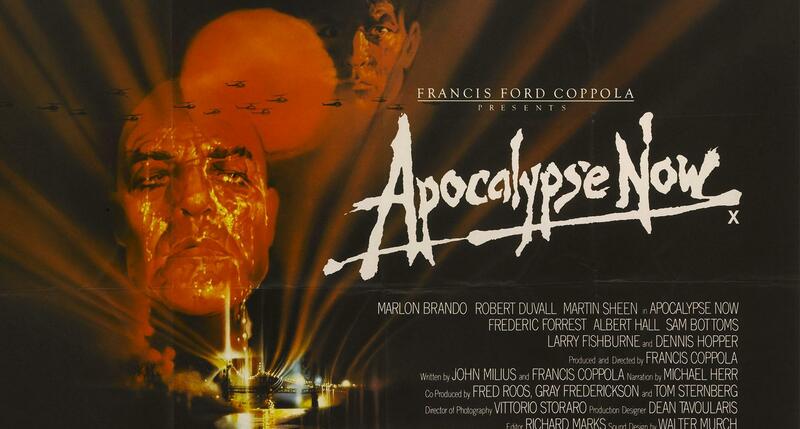 Treat the composition as a whole, and improve letterforms over several passes. It takes practice to achieve precision with hand-drawn lines, so be patient and persistent if initial attempts at refinement don’t feel very elegant. If you have a tendency to hunch over or curl your wrist, be cautioned that a tight grip and poor posture make precision nearly impossible. *Pro Tip: Remember to breathe. When approaching letter curves, don’t hesitate to rotate the canvas. Letterers bring color into the equation at different times, but regardless of when color is implemented, it should be considered from the earliest stages of the hand lettering design process. It varies by client, concept, and design direction, but in general, letter colors should be distinct and easy to decipher. After all, they are communicating a message to be read. Additionally, it’s a good idea to keep color schemes simple. Try sticking to one or two high-contrast colors and one or two less saturated accent colors. *Pro Tip: Don’t be afraid to go bold yet simple with all white letterforms. Let the background and other compositional elements, like photos and illustrations, be the main source of color. Are there any areas of the composition that need tweaking? Would a small pop of strategically placed color add life and vibrancy to the design? Are there too many details in the design, causing the message of the lettering to be obscured? Are there any unintentional words created by the letters themselves? Asking questions like this can push a good design into the realm of great design. The difference often lies in small, detailed choices. *Pro Tip: If time allows, share your work with a trusted designer friend. Let them know that the piece is mostly finished but you’d appreciate if they’d look to see if anything feels unresolved. A second perspective can make a world of difference. As competition among brands intensifies, the value of high quality and highly engaging images increases. 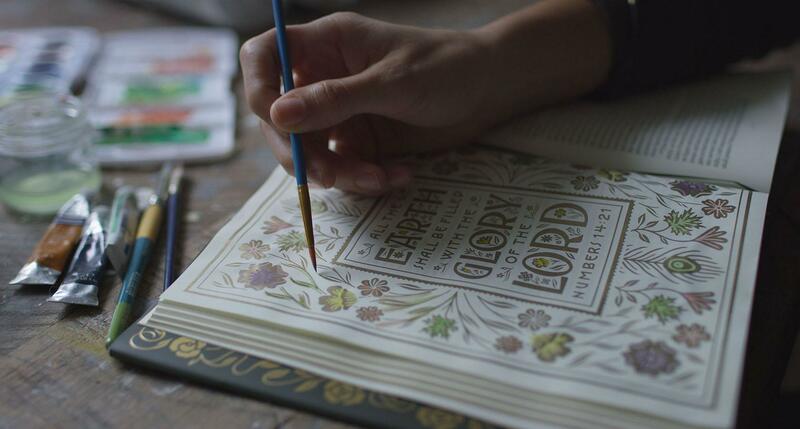 For this reason, hand lettering isn’t a fad: It’s an art form in revival. In our content-driven world, a single word has immense communication potential. As cultural definitions change, context and intent are more important than ever. But how can designers be sure that the words they weave into visual messages convey the right meaning? Digital typefaces have their own elegance and utility, but the spontaneity and versatility of hand drawn letterforms is altogether unique. Through the power of pen to page (or stylus to screen), hand lettering allows designers to imbue words with layers of nuance that touch human emotions. New design tools and techniques seem to emerge weekly, but the centuries-old practice of hand lettering will continue to supply brands and businesses with unique visual content that humans, forever drawn to beauty and originality, will continue to seek out and enjoy.